Newburgh Senior Center | The Daytime Place Where Seniors Congregate! The Fall 2018 Porkapalooza BBQ Fundraiser for the Newburgh Senior Center will take place on Friday, October 12 and Saturday, October 13 from 11 AM – 2 PM at the Senior Center on 529 Jefferson Street in Newburgh. The famous Newburgh BBQ Coalition will be smoking the pork! This is the last smoke open to the public by the Coalition in 2018. Enjoying our pulled pork lunches on Friday, October 12 and Saturday, October 13. Lunches include a sandwich, chips, and a drink for just $5! You can eat in, take out, or even call the Center for take-out orders of 4+ at 812-853-5627 for easy pickup. Pre-ordering baby back ribs, tenderloins, and pulled pork by Tuesday, October 9. Call Colleen at 812-598-8332 to place your order. Full slabs of ribs are $25, smoked tenderloins are $15 each or 2 for $25, and quart containers of pulled pork are $20 each. Ribs, tenderloins, and pulled pork will be available for pickup at the Senior Center on Saturday, October 13 starting at 11 AM. Call today to pre-order your ribs, tenderloins, and pulled pork! We look forward to seeing you on October 12 and 13! The Fall 2017 Porkapalooza BBQ Fundraiser for the Newburgh Senior Center will take place on Friday, September 29 and Saturday, September 30 from 11 AM – 2 PM at the Senior Center on 529 Jefferson Street in Newburgh. The famous Newburgh BBQ Coalition will be smoking the pork! This is the last smoke open to the public by the Coalition in 2017. Enjoying our pulled pork lunches on Friday, September 29 and Saturday, September 30. Lunches include a sandwich, chips, and a drink for just $5! You can eat in, take out, or even call the Center for take-out orders of 4+ at 812-853-5627 for easy pickup. Pre-ordering baby back ribs and tenderloins by Tuesday, September 26. Call Colleen at 812-598-8332 to place your order. Full slabs of ribs are $25 and smoked tenderloins are $15 each or 2 for $25. Ribs and tenderloins will be available for pickup at the Senior Center on Saturday, September 30 starting at 11 AM. Call today to pre-order your ribs and tenderloins ! We look forward to seeing you on September 29 and 30! Porkapalooza 2016 coming to Newburgh Senior Center September 23-24! The Fall 2016 Porkapalooza BBQ Fundraiser for the Newburgh Senior Center will take place on Friday, September 23 and Saturday, September 24 from 11 AM – 2 PM at the Senior Center on 529 Jefferson Street in Newburgh. 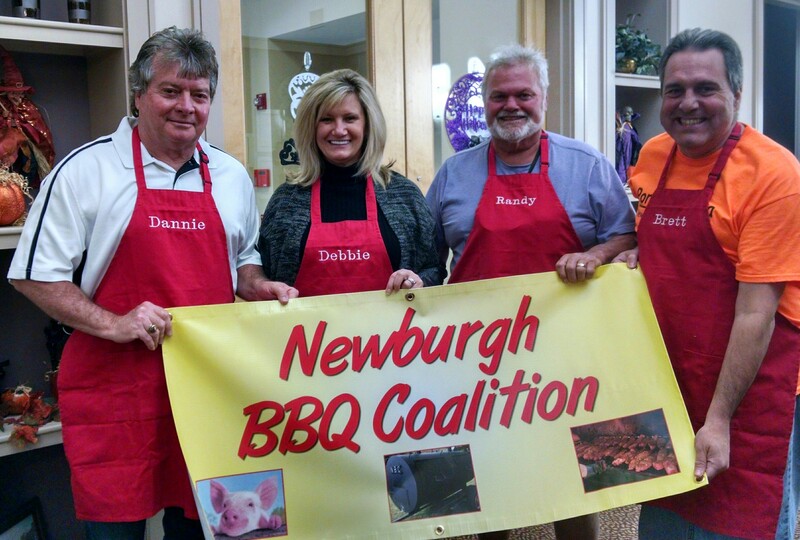 The famous Newburgh BBQ Coalition will be smoking the pork! Thanks, NBC for your great work! Enjoying our pulled pork lunches on Friday, September 23 and Saturday, September 24. Lunches include a sandwich, chips, and a drink for just $5! You can eat in, take out, or call the Center for group orders of 4+ at 812-853-5627. Pre-ordering baby back ribs and tenderloins by Tuesday, September 20. Call Colleen at 812-598-8332 to place your order. Full slabs of ribs are $25 and smoked tenderloins are $15 each or 2 for $25. Ribs and tenderloins will be available for pick-up at the Senior Center on Saturday, September 24 starting at 11 AM. Call today to pre-order your ribs! We look forward to seeing you on September 23 and 24! We try to keep the community informed of all the activities that take place at the Newburgh Senior Center. So we try to be in the paper a lot!! The Evansville Courier & Press usually puts the Newburgh Senior Center in the Warrick County Section. Warrick Publishing is also one of our gracious media friends, publishing our news and photos. 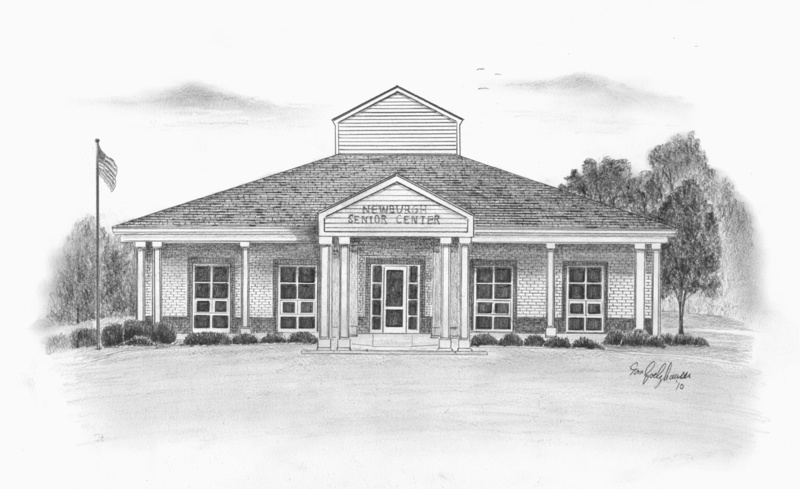 Click on the links above and search for the Newburgh Senior Center to read articles and see photos about the Center. Check out our amazing seniors, variety of activities, and spread the word about us in the community! Thanks to our media supporters! Please check out our Facebook page for the latest news on the Center! To see our most recent photos, please visit our Facebook page! A few of our favorite old photos are in the slideshow below. The Newburgh Senior Center is the “Daytime Place Where Seniors Congregate!” Our mission is to provide the highest quality services for mature adults by fostering a warm, caring environment where individuals can both explore and enjoy a variety of activities to enrich their lives. Our goal is that the Newburgh Senior Center will be the destination of choice for seniors interested in camaraderie, nutritious meals, education, outreach services, entertainment and adventure. The Center has over 140 members, most of whom live independently in homes or apartments in Newburgh and the surrounding area. The Center is open from 9 am to 2 pm each week day. Regularly scheduled monthly activities include: cards, crafts, computer/Internet access and education, health and fitness activities, a reading room, bingo, live entertainment, Tai Chi, consumer education, volunteer opportunities, and even a kazoo band that entertains in the community. Most activities are at no cost. The Center is a non-profit, 501(c)(3) independent organization providing services to area seniors through grants, fundraisers, donations and sponsorships. The Center is a SWIRCA lunch site.